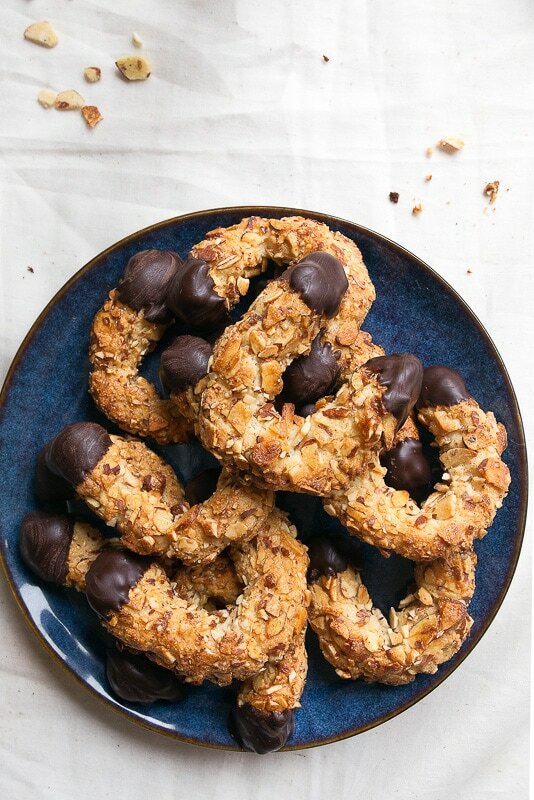 Almond horns: Chocolate dipped almond horn cookies. Naturally gluten free, made with marzipan, almond flour and egg whites, almond horns are my favorite holiday cookie. I feel like I did nothing this past weekend except bake cookies. And I’m very much not complaining about that. Late Sunday night, I finally wrapped everything up and started to deep-clean my kitchen, and while I scraped the counters with a razor blade (the only true way to get sticky pie dough off the counter), I tried to take it all in. The holiday season is here, and I’m trying so very hard to relax and enjoy it. Most importantly, we talk about which foods grace our table this time of year, and how other people enjoy this season. I want Camille to look forward to this time of year, not dread the stress and rushedness of it all. More than anything right now, Camille just craves experiences. She wants to go out and do new things. She wants to see all the Christmas lights at the Botanical Gardens, and she wants to eat dim sum because she sees us humming over how good it is. I don’t know where she learned this, but she wants to grab a chair and stand at the kitchen counter with me. She’s been sitting up on the counter since she was a newborn, but her little brain figured out that if she stood in front of the counter instead of on it, she could participate in the cooking. I vaguely remember pulling a chair over one time, but it etched into her little brain, and anytime I’m standing at the kitchen counter, she’s grunting, huffing and puffing trying to pull a kitchen chair over near me. Rolling cookies is an excellent job for tiny hands. I don’t have any advice on how to stop the hand to mouth tasting business, but I buy local, very high quality eggs, so I try not to sweat it too much. I’m not still lying awake in bed at night, thinking about how she put her entire hand in the pumpkin pie batter and licked it clean on Thanksgiving. I swear I’ve moved on. Fortunately, this dough is very sticky, so when you give a little lump to a kiddo, they will play with it long enough for you to roll out the rest of the cookies. 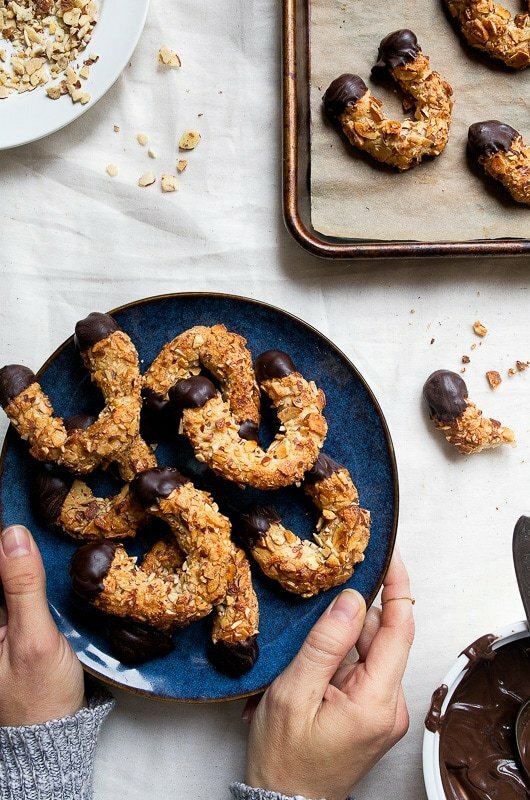 And since it lacks gluten, you can grab that little lump back and work it into the last cookie without any ill effects. Almond horns. Let’s discuss. I’ve only ever had them in New York (I think it was the bakery side of a deli? I’m fortunate to say that I’ve spent so much time in New York since I was a kid that my trips blur together. I can’t remember each eating experience, unfortunately. When I think of New York, it’s just a large feel-good haze about the whole city in general). Anyway, my almond horns are a bit browner and crustier than most chocolate-dipped almond horns. I love a golden brown cookie. I feel defeated when I pull a cookie sheet out of the oven and the cookies are pale. (Sorry, Linzer cookies, you are delicious but you need a tan). I rolled my almond horns in pre-toasted almonds. They will get even toastier in the oven (the best part!). Finally, I brushed them liberally with egg white before baking. And there you have it: the toastiest, most golden-brown, crunchy on the outside, soft and chewy on the inside almond horns cookies. 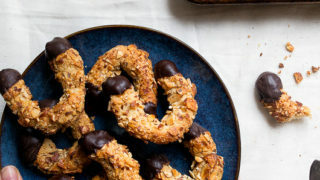 This recipe comes from Leah Koenig’s book Modern Jewish Cooking. I appreciate her variation with hazelnuts, but I went traditional and used sliced almonds. I love that the recipe only makes 1 dozen cookies, too! In a medium bowl, add the almond paste, almond flour, and sugar, and beat on medium speed with an electric mixer until crumbly. It will be quite dry. Mix in 1 egg white and beat until smooth. Dice the sliced almonds finely and place in a shallow bowl. Divide the dough into 12 equal balls, and roll them out into 4 1/2" ropes. Roll them in the almonds to help with the stickiness of the dough. Move the ropes to the baking sheet, forming them into horn shapes as you place them. Beat the remaining egg white with a teaspoon of water, and brush it on the cookies. Bake for 13-14 minutes, and let cool on the baking sheet for a few minutes. Meanwhile, melt the chocolate with the oil either in a double boiler or on 50% power in the microwave (30 second pulses, stir between each pulse). Dunk the ends of each cookie in the chocolate, and place back on the baking sheet to set. You can chill the cookies until the chocolate sets, or let the set at room temperature. They keep covered for up to 4 days. These look delicious! Just curious, do you buy your almond paste or make it yourself? Your daughter is absolutely gorgeous and adorable, by the way. I just watched the video on Instagram stories where she is eating quinoa out of the fridge… so cute! Thank you for the wonderful recipes! I love your blog. That just warms my heart (and makes my ovaries tingle :P) that Camille wants to help you!!! SO CUTE and sweeeeeet. That’s like the dream <3 And these almond horns are beautiful-classic and pretty and delicious! My friend & I ate a lot of these in college at a local bakery, so I plan on whipping up a batch and mailing them to her. Thanks for the recipe! 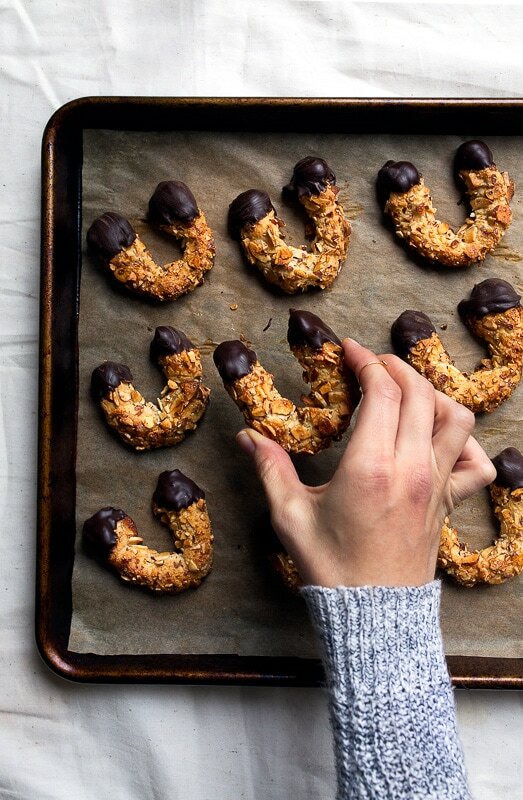 this looks wonderful, hadn’t seen these before and toasted almonds seem like a perfect pairing with the chocolate, thank you for sharing this! I think it’s important to note that if this is your first time cooking with almond paste it helps to grate the paste into the mixing bowl. It’s much easier to mix in that way. Looking forward to making these again! Thank you! Good point! Thanks so much, Charlotte! Just made these. My husband and I loved them! Hint: I repeatedly wet my hands under cold water and gave them a shake during the rolling out process to keep dough from sticking to my hands.